Ho-kago Tea Time (After School Tea Time) is a fictional band that appears in the television anime/manga “K-ON!” and it’s sequel, “K-ON!!”. The band performs the theme songs for the anime, as well as the insert songs. 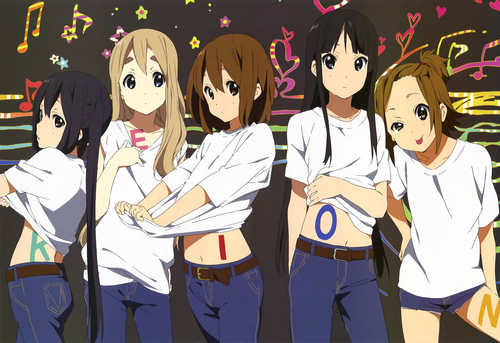 It is comprised of five members; Yui Hirasawa (CV:Aki Toyosaki), Mio Akiyama (CV:Yōko Hikasa), Ritsu Tainaka (CV:Satomi Satō), Tsumugi Kotobuki (CV:Minako Kotobuki) and Azusa Nakano (CV:Ayana Taketatsu).